New earphones follow the success of award-winning Massdrop x NuForce EDC IEMs. The Massdrop x NuForce EDC3 IEMs are a standout product with key high-end audio elements to satisfy the needs of discerning yet price-conscious audiophiles. Following our mutual success with the award-winning Massdrop x NuForce EDC IEMs, which continue to be a great seller, we’re thrilled to bring an even more fully refined product to the Massdrop community, marrying incredible sound, design, and features for an unbelievable price. Optoma NuForce, a world-leading manufacturer of audio products, today announced its next collaboration with Massdrop, a community-driven commerce platform, at CES 2018 with the new Massdrop x NuForce EDC3 IEMs (In-Ear Monitors). On the heels of the success of the award-winning Massdrop x NuForce EDC IEMs, which won The Absolute Sound’s “Product of the Year 2017” award in the earphone/IEM category, both companies are thrilled to release new IEMs for discerning yet price-conscious audiophiles. Made with direction from Massdrop’s audiophile enthusiast community, the EDC3 IEMs combine key high-end audio elements and attributes to create a standout product that meets their highly refined needs. Featuring three balanced armature drivers for true audiophile performance, the IEMs will be available in early February for just $99 – one-third the price of competitive products. Premium sound: The Massdrop x NuForce EDC3 IEMs meet the needs of Massdrop’s discerning audiophile community, with three balanced armature drivers for spacious, crystal-clear and resolving sound. Handpicked drivers: The three balanced armature drivers used in the EDC3 are handpicked and measured to match the target frequency response. Premium quality control: Similar to any valuable high-end earphones and speakers, the EDC3’s left and right earpieces are measured to match each other within +/- 2 dB. Proprietary crossover design: As any other NuForce multi-driver in-ear monitor, the EDC3 utilizes an advanced proprietary crossover design that allows the drivers to provide seamless and smooth frequency transition from one driver to another. Replaceable cables: Each EDC3 comes with two cables: a braided cable for superior audio and a microphone cable for convenience when listening on the go. Lexan earpieces: The EDC3 earpieces are acoustically calculated to provide the best sound quality with the most comfortable fit and superior noise isolation. 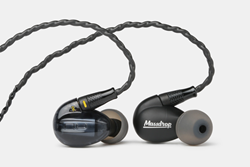 The Massdrop x NuForce EDC3 IEMs come with silicone and foam ear tips in multiple sizes, a carrying pouch, and two cables. They will be available for purchase starting early February on Massdrop’s website. Optoma Technology is a world-leading designer and manufacturer of award-winning video and audio products for home entertainment and theater, ProAV and business. With a focus on premium quality and functional style, products are designed with the end-user experience in mind. Optoma and its audio brand NuForce deliver stunning crystal-clear images and exceptional sound with ultimate reliability. Optoma Technology is part of The Optoma Group, which has continental headquarters in the U.S., Europe, and Asia. For more information, please visit: http://www.optomausa.com. Massdrop is a community-driven commerce platform where members can connect, learn, and shop with people who share their interests. Its enthusiast communities range from audiophile, outdoor, and men’s apparel to cooking, quilting, tech, and more. Along with collaborating with other brands to make new products, Massdrop carries the most requested products from other manufacturers and helps small designers bring their product ideas to life. Founded in San Francisco in 2012, Massdrop is now home to millions of members.